Covent Garden is London’s entertainment district; it is home to the Royal Opera House, theatres including the Palladium and Theatre Royal, and countless bars and restaurants, all focused on the iconic Piazza. Covent Garden is bounded by Shaftesbury Avenue to the north, Kingsway to the east, Charing Cross Road to the west and the river Thames to the South. At the centre lies the well-loved Covent Garden Piazza; site of the first open square in England. No one knows more about residential properties in Covent Garden than CBRE, having been experts in the area since 1899. It is one of London’s most famous entertainment and shopping locations with a great history of theatre that still resonates today. If you’re looking to buy property in Covent Garden, you’ll be spoilt for choice with the mixture of entertainment and architectural beauty. This collection of residences has appealed to the rich and famous for some time, with the Piazza being one of the most sought after residential addresses in the capital. Covent Garden’s name hails from the 13th century; it was a site which belonged to the Convent of St Peter at Westminster. This ‘convent garden’ became a prominent source of London’s fruit and vegetables. In 1540, following a dispute with the Roman Catholic Church, King Henry VIII dissolved all of the country’s monastic properties and granted the land to the 1st Earl of Bedford. In 1627 the fourth Earl of Bedford commissioned architect Inigo Jones to build houses ‘fit for the habitations of Gentlemen’. Influenced by classical Italian architecture, Jones built St Paul’s churchyard, located behind the Piazza, and three sides of terraced houses which looked out onto an open courtyard. Covent Garden has evolved into one of London’s most famous locations, commonly associated with entertainment and shopping. 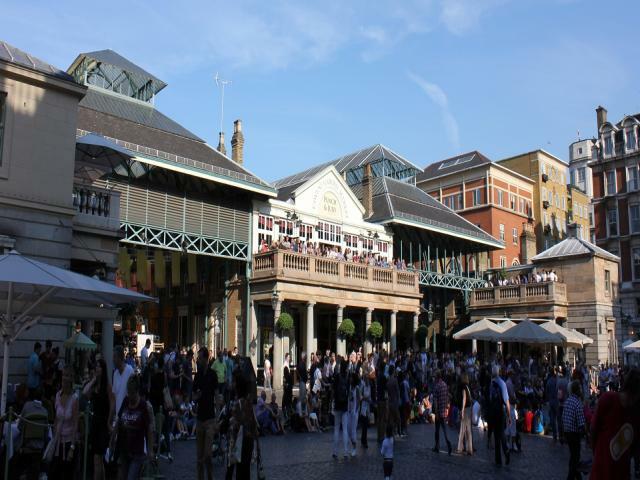 Through the curatorship of principal local landowners Capco, retailers such as Nicole Farhi, Aspinal of London, Chanel and Mulberry have all helped to make Covent Garden one of the most popular shopping districts in the capital. The recent opening of Burberry, Ralph Lauren and Apple has further enhanced this reputation. As well as being a retail hot spot, Covent Garden is home to some of London’s greatest theatres; with over a dozen venues showing world famous productions such as The Lion King at the Lyceum and the world’s longest running play; Agatha Christie’s The Mousetrap at St Martin’s Theatre. The area is popular with stage actors and actresses, ballet dancers and opera singers, all of whom enjoy the vibrant and welcoming nature of the pubs, bars and restaurants. Around the Piazza daytime shoppers, tourists and street performers turn to numerous bars, clubs and pubs in the evening, while theatregoers head to the New York import - Balthazar and London’s oldest restaurant, Rules, on Maiden Lane. Away from the buzz of the Piazza and surrounding shops is some of London’s most striking architecture. The famous Royal Opera House commands the scene on Bow Street, while the cobbles on Floral Street, Neal Street and Seven Dials offer period charm reminiscent of 17th century London. We're sorry, there is nothing that matches your exact requirements. Please try a different search using the search options on the left.